After the demonstration that took place in dresden on saturday, several refugees decided to occupy Theaterplatz. We stand in solidarity with this occupation and support the refugees’ demands. 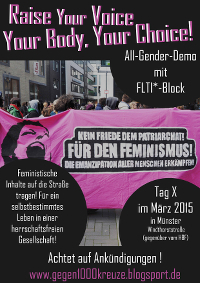 For all, who wanna go out on the streets on the International Women’s Day 2015: there are two demonstrations organized in Leipzig and Berlin, 8th March 2015! Since there’s a nazi demonstration on Sunday afternoon, the cafém will probably finish at around 3 pm. You can, however, join us on a trip to the Altstadt. Dresdens 1945′ on www.abolishcommemoration.org : Abolish commemoration. Critique of the discourse relating to the bombing of Dresden in 1945. The 15th February will be the date for the 17th version of the cafém. As it might get busy around that date we decided to have a relaxed sunday and watch a movie. The movie is an intimate glimpse into the world of two jewish friends who live together in Berlin. Having survived the Holocaust and then stayed in Germany after the war, it is the food they cook together that they remember their childhoods, maintain a bond to each other and answer questions of heritage, memory and identity. As the film follows them through their daily lives, a portrait emerges of two women with a light sense of humor, vivid stories, and a deep fondness for good food. Created by Oma’s granddaughter Alexa, the film captures their ongoing struggle to retain a part of their past while remaining very much engaged in the present. We want to warn in advance, that the movie has some fleshy scenes that might be too much for some people. But don’t be afraid, there wont be meat in the cafèm, instead we will have a delicious vegan buffet as always. You are welcome to bring some good stuff. we want to invite you on Wednesday (01/28/15) for a meeting and we are still very happy that so many of you came last week. We wanna have fun together. Let us meet on Wednesday, at Albertplatz (Jorge – Gommondai – Platz) , at 4pm. After meeting we will go to another place. You can take the tram/train number 3,6,7,8,11 to Albertplatz. nous voudrons bien vous inviter mercredi (28.01.2015) pour une dexième rencontre. Nous sommes toujours contentes, que vous êtes venues tellement nombreuses la semaine dernière. Nous aimerons faire votre conaissance et vous rencontrer. Nous aimerons mettre à votre disposition un lieu, ou vous pouvez parler et vous organiser vous-mêmes. Nous aimerons savoir de quoi vous avez besoin. Nous aimerons bien nous amuser avec tout le monde. Réunissons mercredi au Albertplatz (Jorge-Gomondai-Platz) à 16 h.
Ensemble, nous irons vers un lieu ou on peut prendre un café et bavarder. On parle seulement l’anglais, le Francais et l’Allemand. Est-ce que une d’entre vous peut traduire en Arabe ou Tigrinya? Du browst gerade in den e*vibes Weblog-Archiven.